The Green Frog stands out amongst the most varieties of frogs primarily because of its enormous size. 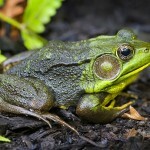 The frog, abundant in the US and Canada has two popular sub-species, namely, the Northern Green Frog and Bronze Frog. The green frogs have sparkling big eyes that help them look in any direction. 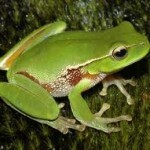 Green frogs have tympanum, a round shaped spot that helps them in hearing. Whenever a sound strikes their ear, it starts vibrating. The brain then begins to comprehend the sound. The green frogs do not like to attack or run after the preys. Instead they have just about anything that is easily available. 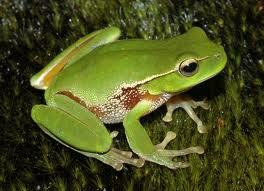 As compared to other frogs, green frogs are larger in size and mostly inhabit eastern parts of USA and Canada. 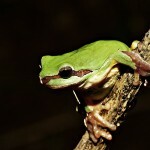 It has two sub species, namely; Northern green frog and Bronze frog. In size, the females appear much larger than the males. The peculiar distinguishing feature amongst females is that the size of eyes and tympanum are almost equal. In males, the eardrums are much larger than the eyes while the throat is bright yellow. 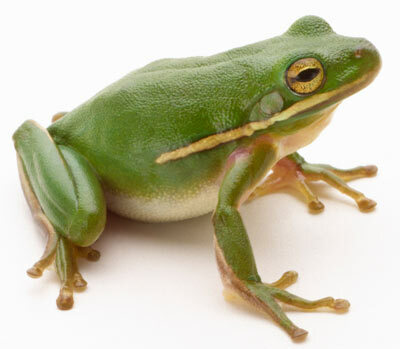 Size of Green Frog: The length of the green frog varies within 5-10 cm. Color of Green Frog: As the name suggests they are in green in color and vary in various tones of green adorned with few spots. The legs have dark stripes while the belli is attractive white. The green frogs also have folded skin that runs through the back. This characteristic distinguishes from the bullfrog. The call is given by the male frog and it is characteristically quite sharp and loud. It simply produces a single tone when intending to protect its kingdom. 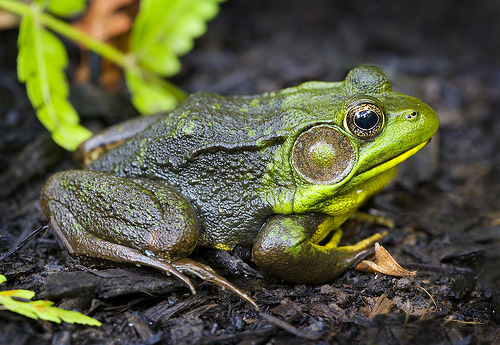 The green frog usually dwells in the eastern parts of USA and Canada where they are mainly concentrated in the southeastern part of Manitoba. Geographically, these species mainly thrive on fresh water ponds, lakes, roadside ditches, and swamps. This is because they quickly jump into water when they sense danger. The green frogs have invertebrates, shrimps, spiders, tadpoles and smaller snakes. The smaller ones generally feed on water plants and algae. The prime time for their mating starts from April and runs up to August. They usually like to mate in permanent or semi-permanent water bodies. The males let out a call aloud to attract females from various kingdoms. They do not clutter up like other frogs. While breeding the males grab the females from back with the help of the fore limbs. Then the male produces the sperm that flows into the egg. This results in the fertilization process. The females lay about 4000 eggs in water especially at places where there is underwater vegetation. The tadpoles have olive green bodies but are creamy white at the lower portions. Within a period of one year, they transform into froglets. The females attain sexual maturity within 2 to 3 years while the males attain by the age of one. The adults like to stay withiin water while the younger ones wander over lands. They mostly prefer to thrive on soil and wet grass. 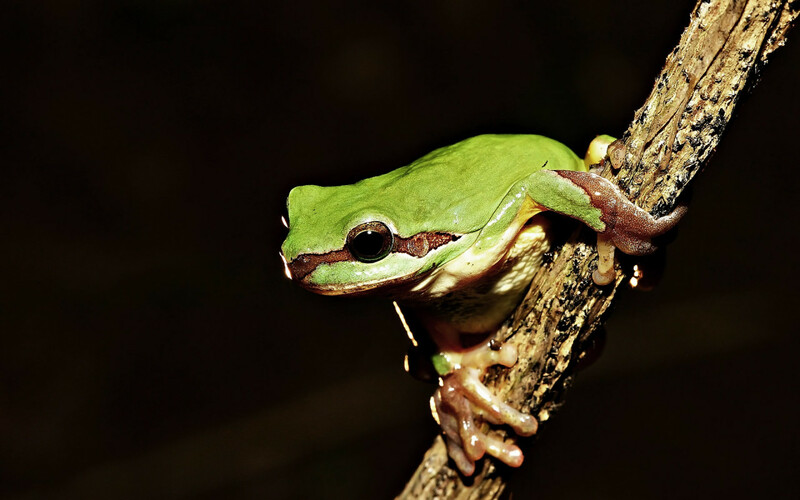 Green frogs mostly remain active during the time of day and produce their typical sounds during the nights. Habitat of Green Frog: The tank capacity should be atleast 10 gallons but it should be half filled in water and half by dry land so that the frogs get adequate land and water habitat. Also the land needs to be a little damp and some soil moss should help in the same regard. The water needs to be renewed regularly. Also some wood or bark of a tree can be used for some uv fluorescent light to brighten up the habitat. 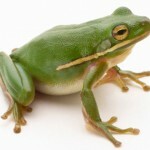 Diet of Green Frog: They usually like to have insects, cricket, worms, and Cray fish. The smaller frogs feed on snakes, fishes and vegetables. Hygiene of Green Frog: The tank should be kept clean and usage of up to 1% bleaching solution is permitted if the smell is properly washed away. Dirty water may be vacuumed out while furniture and rocks need to be cleaned in boiled water to keep them free of germs. They green frogs can live for up to 5 – 8 years. It is not considered to be threatened and is not in the red list published by the IUCN.